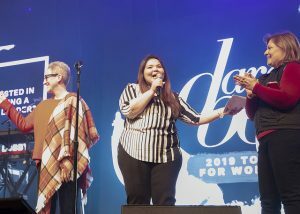 (Washington, DC) – WGTS 91.9 hosted over 2,200 women at the recent “Dare to Be” women’s event with Natalie Grant and Charlotte Gambill at the Hylton Christian Event Center. The station has hosted this event for the past six years. This year’s theme of “Speak to the Storm” addressed the lives of women in this area, many of which faced two lost paychecks through the government shutdown. Organizers offered free tickets to any woman who wished to attend with a federal government employee badge. Through music, prayer and the inspirational messages Natalie and Charlotte encouraged women to live their roles as wives, moms, employees, daughters and friends to the fullest.